This support activity was substantial, Empire-wide and continued into the Soviet period. The standard reference for Tsarist times is The Modernization of Folk Art in Russia. A kustar’ was a crafts person working at home (typically helped by family members) making items for sale, for peasants, an important source of income. Outside intervention came first (1885) in the form of aristocracy philanthropy, but in due course, after extensive surveys -- 17 volumes in the report -- revealed the decay of craft quality, the government began various programs: distribution of materials; training facilities; art schools (for drawing skills); stores; museums with model examples as well as sale items; exhibits at local, regional, and international expositions; and overseas outlets. Below, photographs of a training studio for instructors soon to be at work teaching in the provinces, and one of a textile made in such a studio. 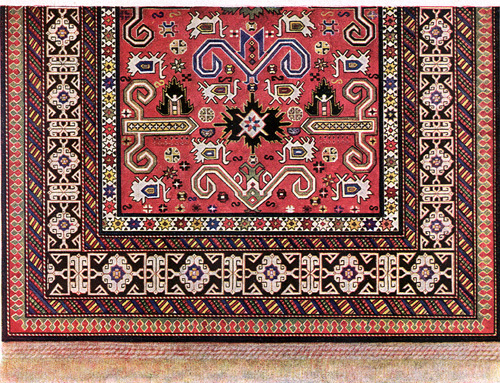 Some ad hoc carpet surveys within Caucasia had been completed in the 1880’s for Shusha city and in the North Caucasus; a carpet exhibition was held in Tiflis in 1888. (Shown is a poor quality photograph of one of its objects, a Kuba sumak.) 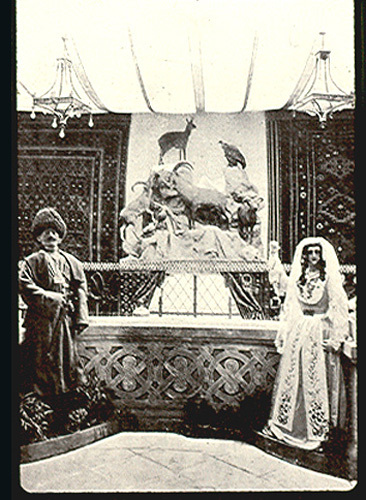 Carpets were on display at the great Paris exposition of 1900, pavilion entrance photo below. A Kustar’ Committee with region-wide responsibility for on the order of 40 crafts was formally established in 1899. Proceedings of this group’s October, 1901 general convention dealt with the nub of the carpet problem, via a report by O. I. Shmerling on “Concerning methods of collecting antique designs of Caucasian kustary production and concerning the development of local artistic motifs.” The term antique was used advisedly rather than “old” and likely means the decades before 1880. The report called for a comparison of “antique” and “new” carpets via a “serious study” of designs and colors. The problem to be overcome was loss of (1) originality, (2) “typicalness”, (3) “beauty”, (4) “colors”, and finally, (5) the rapid adoption of European “characteristics and style” (particularly “garlands of roses”) which were “taking the place of purely local designs”. Another concern was that the need was correcting a situation wherein typical rug designs “well known” for being present “only in its location” were blended into designs of “other localities” making it “impossible” to sort out one rug from another. And this “mixing together” of elements of various types had a “harmful effect” on the “integrity” of the design and beauty of a carpet. Part of the motivation for reform was a perception that in the export market knowledgeable individuals wanted only “typical examples” of carpets from “a given location”. All in all, the requirement was the assembling of a large collection of styles and characteristics, “by shape”, ie: format; “dyes”; “and for localities, designs.” This task was seen as “difficult”, “very serious”, and “extremely important”, requiring “thorough” knowledge, “as soon as possible”. Since no single individual would have the capacity to do this, particularly with respect to “the study of typical designs of various locations,” the necessary step was creation of a central facility. Photography was the correct approach to documenting designs, a procedure already underway in the silver and gold crafts. In sum, the emphasis throughout the report was the importance of unscrambling the design mélange and determining correct traditional patterns for the villages. Upshot: “The meeting approves of this presentation and declares the desirability of establishing of a central facility (shkol)." By 1901 the Committee had considerable experience in the field; the detailed surveys of carpet-making in Kuba district and of the Kurds in Erivan province would soon be published. (1902--03). Another conference report discussed the deterioration of color quality and measures to eliminate bad synthetic dyes, taking considerable care to stress that any effort to change kustary practices required agents who knew the local language, and with whom the women would talk. “In view of the importance of the kustar’ craft industry for the Caucasian population the Kustar’ Committee decided to gradually introduce a series of measures for its improvement and development. In the same way the Committee made it a priority to introduce measures aimed at helping kustar’ weaving…. 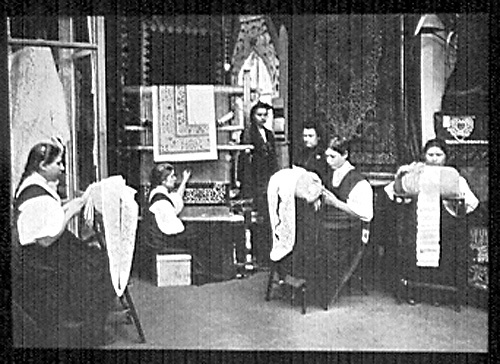 “The Committee has subsequently expanded its activities, and at the present time maintains and subsidizes training carpet and weaving workshops in various districts of the Caucasus, and does everything in its power to encourage the kustary to use the old patterns and to make sure that the carpets are made from yarn dyed in fast colors. Nonsense. The facts are exactly the other way around. The inability to link particular rugs to particular places was the problem which the “Russian bureaucrats” (not ethnic Russians) set out to correct by untangling mixed designs and by reinstituting traditional designs for the right locations. It did not make a problem; the export market had already done that. Kustar’ support activity is well documented but lies behind the iron curtain of the Russian language. Information in English, however, has been accessible for quite some time, and obscurely (See note 4), for more than 20 years. A private association is free to say whatever it wishes and its standards are its business. The show, however, traveled, and the wall label appears at the open to the public Textile Museum in Washington. One can not help wondering what its standards are and what it sees as its responsibilities for the accuracy of information on its walls. 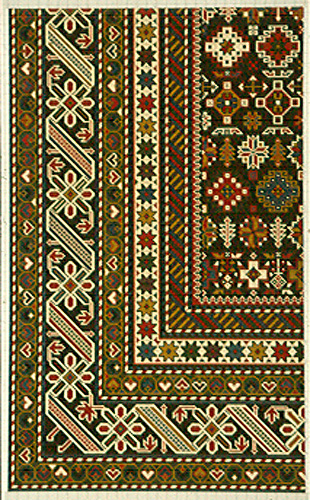 A comprehensive description of carpet-making in Caucasia is contained Isaev’s 1932 book (the base work underlying the Kerimov et al publications begun in the early 1960’s) which covers both the Imperial and the early Soviet periods and uses a taxonomy which is based on structure and geographic area. Its illustrations are taken from a Zakostorg catalogue (the Soviet export arm) published in Leipzig; all color plates cite village of origin. There are more than 50 of which 22 appear in Isaev; two are illustrated below. 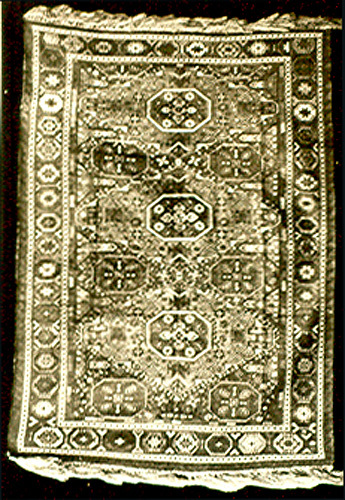 There can be considerable confidence that the patterns originated in the Imperial period; so think carpet people in Tblisi and in Baku: the Zakostorg project “came up with the better designs of antique carpets.” Whether as is likely from the prior work or from its own, the outcome -- antique traditional designs -- is the same. Sorting out the carpets from Caucasia in design terms is tricky. One hurdle is the frequent assumption of a bogus specificity and a false exclusivity. Adding to the problem is the widespread use of the first set of names available in English (second hand hearsay deriving from Kerimov) with a garbled typology. World War I and civil war halted carpet-making for at least ten years. A key question is how effective had been the support efforts begun in 1901; the answer lies in the kustar’ program archives in Tblisi which will have a good deal to say about the specifics of what went on, where, a nice project for the conscientious student (who has Russian); access help from the Georgian State Museum can be assumed. There is indeed a question about central authority activity impact on local traditions, particularly for the Soviet period. Although the Caucasus kustar’ committee showed not a whiff of interest in design innovation, the Soviets radically altered the system, eliminated its bourgeois elements and imposed considerable central control; change began. In Caucasia there were major departures in some districts, notably the introduction of very different carpet types (fine yarns, short nap) in Armenia. 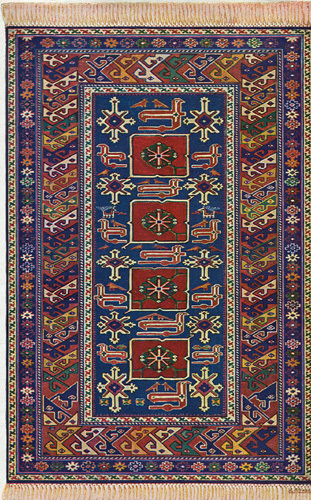 There was, however, continuity: one of the early Soviet activities, a 1926 exhibition in Kuba district of its rugs, consisted of traditional designs. In Caucasia the hallmark of the support program was a return to correct village-centric traditional designs. Despite marketplace distortions many designs are correct, particularly for the tightly woven products from the eastern half of what is now the Republic of Azerbaijan. While it is unrealistic to assume that the old support program had great success in confining designs to a single location, to consider whether a particular rug came from one village or another in a given weaving zone is pointless. What matters is an accurate nomenclature based on the most appropriate village of its origin. The point concerning the kustar’ program is that it did not obfuscate but, rather, rescued traditional art. Salmond, W., The Modernization of Folk Art in Russia, The Revival of Kustar’ Art Industries, 1990. Trudy Pervago Svezda Deyatelei, Kustarnoi Promyhshlennosti Kavkaza, Tiflis, 1902, p. 121-22. Complete text can be found in R. E. Wright Research Report, VI, No. 3, 1988. Kavkzskii kovry. Albom ispolnitel’nykh risunkov dlya kustarei. Vypusk I, SPB, 1913 g.
 An accompanying catalogue used similar language. 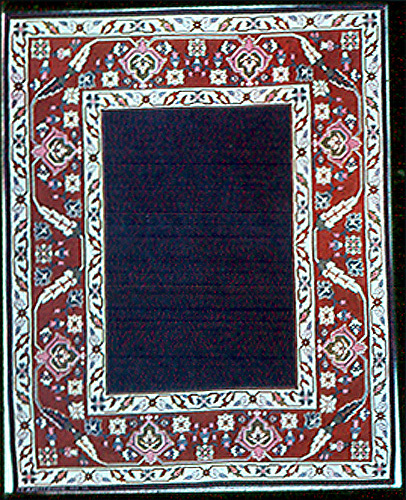 See Wright and Wertime, Caucasian Carpets and Covers, 1995, p. 156. Isaev, M. D., Kovrovoe proizvodstvo Zakavkaz’ya, Tiflis, 1932. A copy apparently has languished untranslated for many years in the HALI office. Where one of the export kustar’ sales outlets run by Zagostorg was located. Tsitsivili, D., Opovyshennii tvorcheskoi roli masterisy protsesse izgotovleniya kover, Iskusstvo votchnikh kovrov, Baku, 1972, p. 272. Abdullaeva, N., Kovrovoe iskusstvo Azerbaidzhana, Baku, 1971, p. 84. A neat observation by the late Barry Jacobs. Kerimov, L., Aezrbaidjanskie kover, 1961. Schurmann. Ulrich, Caucasian Rugs, 1965. Salmond, W. , op. cit, Epilogue. Wright and Wertime, op. cit., p. 154.